I’ve shopped at Beautyhabit many times over the past decade, and I always enjoy their e-mail announcements of new additions to their product catalogue. Thanks to their latest message, I’ve just learned about London-based aromatherapy Andrea Garland and her line of natural lip balms packaged in vintage and vintage-inspired pill boxes. 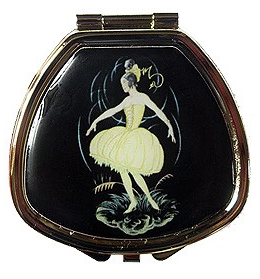 This vintage-look box with a 1920s-style illustration of a dancer is particularly charming. I wouldn’t mind keeping it on my desk or in a safe inside pocket of my handbag. The lip balm inside is a blend of beeswax, shea butter, and red raspberry seed oil, with benzoin, grapefruit (anti-bacterial! ), and lavender extracts. The price ($22) is a little high, and I don’t usually like balms in pots (unless I’m using them at bedtime, when I’ve just washed my hands), and I’m sure I could find a cute pillbox somewhere and mash a stick of natural lip balm into it… and yet, this really is a sweet little item. You can see more of Andrea Garland’s creations at Beautyhabit and the Andrea Garland website. Seriously though, I do love lip balm. I don’t even wanna think about how many Lip Smackers we have at home – my toddler daughter is obsessed with them. Lately I’ve been loving the Perfume Pharmer’s natural strawberry lip balm.